One method to help inspire our students’ imaginations is to provide them with writing prompts. It can help them think of new ideas, jog their memories, make a connection, or simply inspire them to try out a topic. But where can they get writing prompts? Certainly there are loads of helpful websites providing multitudes of prompts. 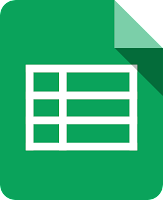 However another option is to use a Google Sheet. Yes that’s right. 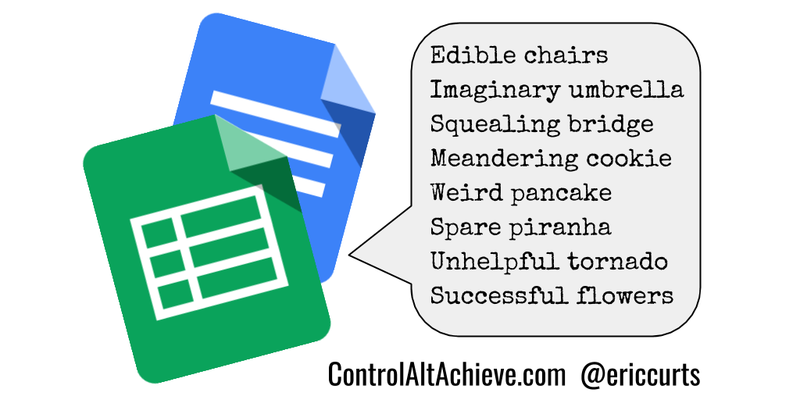 A Google Sheet (often thought of as just a math tool) can help inspire writing! You can get a new set of 20 random prompts by refreshing the page in your browser. Many of the prompts may not make sense or may not be a good match. However, students will likely find one or two interesting, funny, or inspiring combinations in the list. 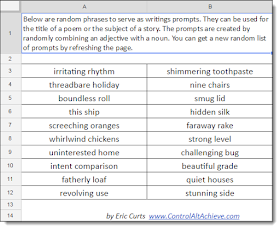 Students should write down any prompts that seem interesting to them, then refresh the page to get a new list of prompts. They can repeat this process until they have a good list of prompts to draw from to begin their writing. If you want to change the words banks, you can edit the Adjectives or Nouns tabs. You can delete any row to remove a word. 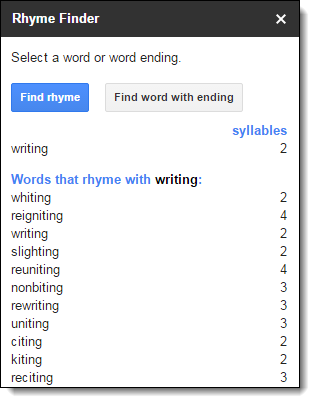 You can add more rows at the bottom to add your own words. The formula on the Prompts tab will pull from your new list of available words. Basically the formula randomly picks a row from the Adjectives tab and the Nouns tab, and then puts them together with a space between the two words. 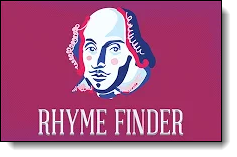 In addition to the “Random Writing Prompt Generator” spreadsheet, another tool that may come in handy is the “Rhyme Finder” add-on for Google Docs. This is a tool that provides a list of rhyming words for any word you select in a Google Document. When your students are done creating their poems or stories, be sure to encourage them to share their writings. Whenever possible it is great for students to share their products with a broader authentic audience beyond just their teacher or their kitchen refrigerator. Thankfully Google Docs makes it easy to share their work with the world. 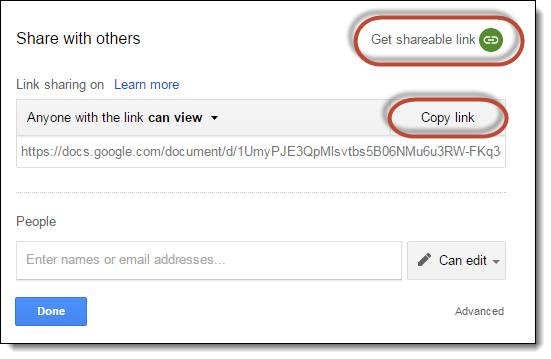 Click the “Share” button in the top right corner of the Google Doc. The “Share with others” window will open. Click the “Get sharable link” option. This will allow you to choose if anyone in the world can view the document or just users in your school. You can now click the “Copy link” button to copy the hyperlink for the document. Anyone who has the link will now be able to view the poem, story, or writing. And in the spirit of sharing, below are links to several poems I have written using randomly generated titles. This is something I have done for years with my children as a fun family activity. 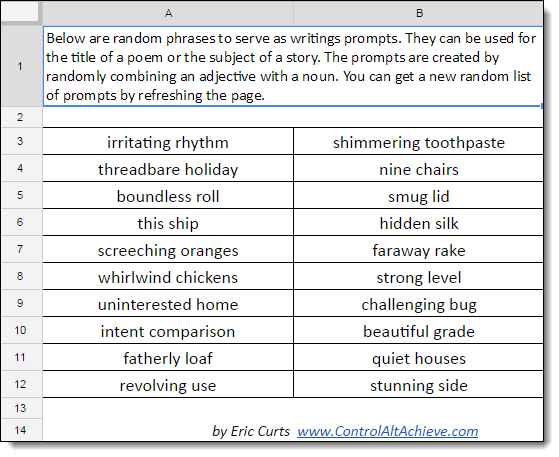 If your students create poems with the “Random Writing Prompt Generator” spreadsheet, consider sharing them in the comments below. Or share any other ideas you have for inspiring and assisting students as they write. Thanks! Gotta love nerdy science poems! Thanks for creating and sharing the Prompt Generator. This is great. Your poems as examples will surely inspire and entertain young and old writers alike. Thank you for doing -- and sharing -- your work. I am not an English teacher but I like your posts because it puts technology into action. Not just a "here is this tool approach", but "this is the tool in action" or "this is how I have used the tool". Great stuff Eric. Thanks! As educators we always need to be thinking how technology can affect teaching and learning in a practical way. Thank you for sharing! Great use of Google Sheets. Thank you for sharing. I have already learnt so many things through your posts. Thanks again. This is great tool, going to share with my English teachers. I am also going to miss not coming to Ohio this summer, Oklahoma is hot & humid in July. Great to hear from you Tammy! You still hold the record for traveling the greatest distance for our training (and probably always will!) Excited to see what your teachers and their students do with the writing prompt generator. Nice use of Google Spreadsheet ! One slight mistake in your approximation in the number of possibilities : it's not two million, but 1000^2000, which is waayy more ! Your personal essay writing service great helped him thanks for share it. I really like these ideas...do you know if there is a way to do this for a World Language classroom? I would love to use this kind of creative writing prompt with my AP students. You can take help with paraphrasing services. This site is valuable and informative for the students who have interest in writing services. I am very happy to see this site. I love your ideas. Thanks for the hard work and great shares. Love the poems and the ideas generators. Your ideas are just wonderful! Thank you thank you for sharing!